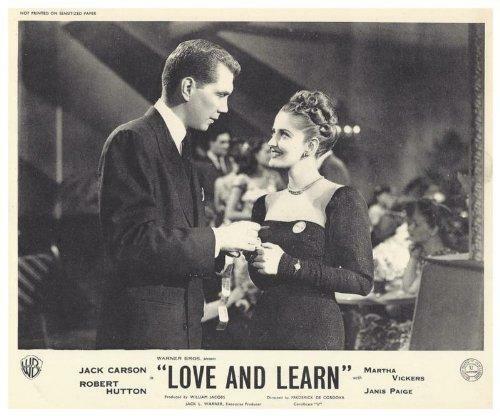 LOVE AND LEARN (1947) is a genial musical comedy just released on DVD by the Warner Archive. LOVE AND LEARN reunites three cast members from the previous year's THE TIME, THE PLACE AND THE GIRL (1946), Jack Carson, Martha Vickers, and Janis Paige. Dennis Morgan of THE TIME, THE PLACE AND THE GIRL is absent here, swapped out for Robert Hutton. 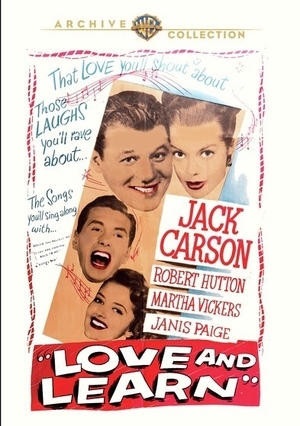 That change, combined with LOVE AND LEARN being in black and white instead of the earlier film's Technicolor, makes LOVE AND LEARN more of a "B" movie, but it's still good-natured and entertaining, with some nice music. As it happens, the background score when Hutton and Vickers meet is an orchestral arrangement of the gorgeous "Oh, But I Do" from THE TIME, THE PLACE AND THE GIRL. However, LOVE AND LEARN has some pleasant music in its own right, chiefly "Would You Believe Me?" Carson and Hutton play Jingles and Bob, composers who've been having a tough time selling their songs. 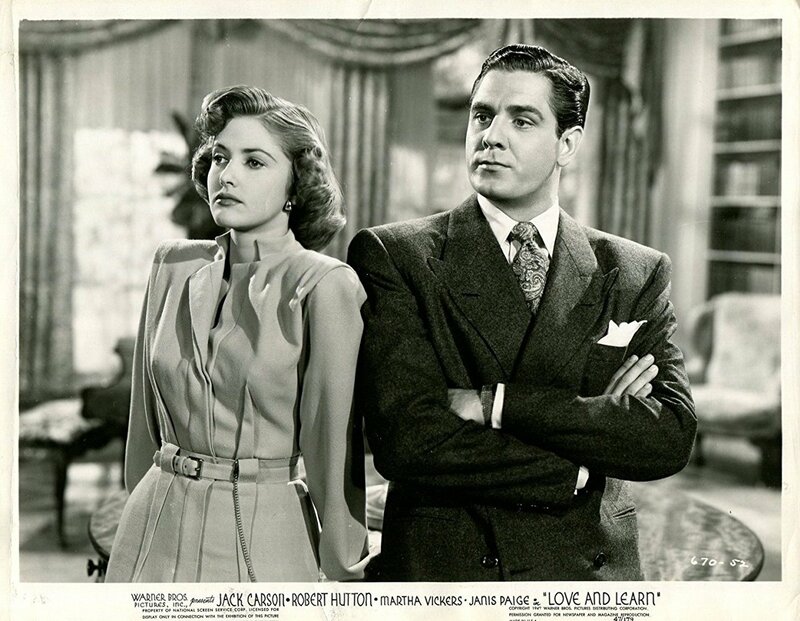 Hutton's about to call quits and head back to his small town when he meets lovely Barbara (Vickers) at a dance hall. 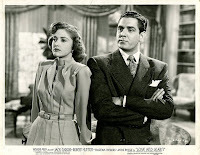 Bob has no idea that Barbara is a wealthy heiress who visited the dance palace on a whim, and she decides to keep her background a secret while they get to know each other, going so far as to rent a small apartment with a Murphy bed where he can call for her. Bob falls head over heels for Barbara and cancels his train trip back home, but her hidden identity leads to a series of comical misunderstandings and misadventures. Jingles has a lovely, long-suffering girlfriend, Jackie (Paige), who unreservedly adores him despite the fact he's not ready to put a ring on her finger after six (!) years. Jingles is self-centered, but that aspect seems to have been invented to be the source of jokes more than anything else, so no one takes it seriously, including Jackie. Paige has never looked lovelier than she did in this, so one wonders if Jingles has problems with his eyesight! One would think he'd grab her before she runs off with someone else. In addition to the pleasant music there are some genuinely funny moments, especially when Bob meets Barbara's parents (Otto Kruger and Barbara Brown). Craig Stevens plays Barbara's long-standing, rather stuffy fiance. Hutton is bland but adequate; on the other hand, I've always been very partial to the charming Vickers, who was just 21 when this was filmed. 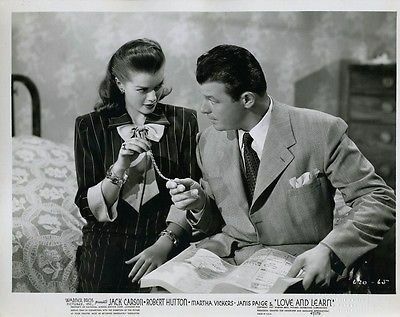 Though she's best known for playing Carmen Sternwood in THE BIG SLEEP (1946), a memorable performance I doubt she ever equaled, I love her in the handful of late '40s Warner Bros. musicals and comedies in which she appeared. The supporting cast includes Herbert Anderson, Florence Bates, Tom D'Andrea, Angela Greene, Don McGuire, John Alvin, and Jane Harker. Familiar faces such as Iris Adrian, Byron Foulger, and Grady Sutton can also be spotted. 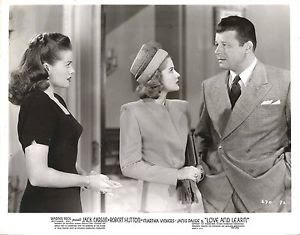 The nightclub singer near the end of the film is Trudy Erwin, who dubbed Lucille Bremer in MGM's YOLANDA AND THE THIEF (1945) and TILL THE CLOUDS ROLL BY (1946). LOVE AND LEARN was directed by Frederick De Cordova and filmed by Wesley Anderson. It runs 83 minutes. The Warner Archive DVD is a fine print with excellent sound. There are no extras. LOVE AND LEARN isn't anything noteworthy, but those who like the cast and enjoy Warner Bros. films of this type will probably like it. I had a good time watching it. I think I saw this film on its original release. The only moment I remember, Carson and Hutton composing in their apartment when the piano Carson is playing is repossessed. The two guys keep on working while the other two guys do their work.